Having great, high quality photos in your yearbook is one of the most important things you can do to ensure you get the best results in your printed book. This article helps to demystify some of the warnings you may see throughout the system, and explain how you can fix the errors. What are these image quality error messages? For each picture that you upload into our system and choose to be printed in the book, we will automatically evaluate it’s quality to see if it is good enough to be printed in a crisp and clear way. If the system thinks the printed result will be bad (because the image you have supplied is not high enough quality), it will let you know at various points. How do we know if the image is low quality? Our system looks at following three bits of information for each photo, and then calculates the DPI (dots per inch) of the photo. 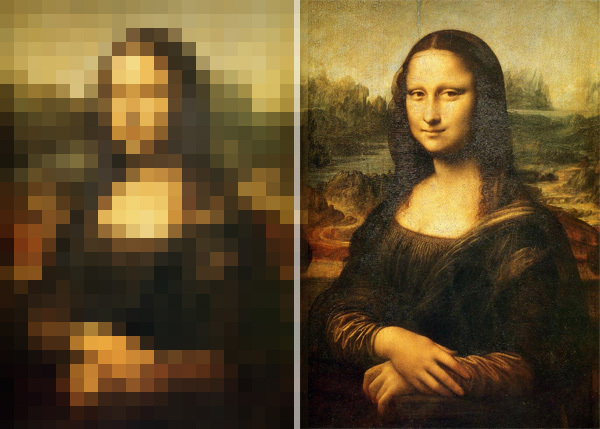 The pixel resolution of the image. Any cropping that has been applied to the image. We print our books at 300 DPI, which produces crisp and clear images on paper. If your image has a DPI that is 300 or more, it will look great when it is printed. However, if the photo’s DPI is less than about 150, it will look very blurry (or pixelated) when it is printed. Anything between about 150 and 250 DPI is not ideal, but can be acceptable if that is the only image that you have. The example below is an exageration, but it shows the difference between an image printed at an (extremely) low DPI and one printed at a high DPI. What can I do to fix my pictures? Change the cropping: Try to select a larger area of the image to get a better result; cropping it to select a small area effectively makes the image much smaller, and will lower the resolution. Use the original file: Try as much as possible to obtain the original version of the photo, and upload that one instead. Often the pictures that you or your users upload have already been compressed or resized many times. For example when you email a photo to somebody or you download a preview picture from Facebook as opposed to the original, you will get a low resolution version of the photo. Take a new picture: Sometimes even the original photo isn’t good enough. For example a group photo taken with an old iPhone won’t be high enough quality to go on a double-page spread. You’re better off finding someone who has got a proper camera taking the picture again. Using the picture somewhere else: If you can’t solve your issue using our suggestions but still want to use the image in the book, how about putting it in a smaller image slot? A picture that is too small to use on a double-page spread could still look great in a smaller photo montage slot.